The final round of the Webbs AC summer series of matches saw league leader Alan Forrest wrap it up in fine style on the Raven Lake at Rookery Waters. Top rod on the day was Gordon Harmer. 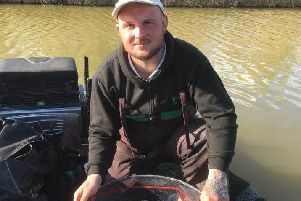 He decided on a small feeder approach despite the venue set up for pole fishing and it worked out well as he finished with a match-winning 22lb 1oz. Then came Forrest with 12lb 3oz, followed by John Woods on 10lb 10oz. Still at Rookery Waters Ramsey AS fished the Jay Lake and leading the way with a fine net of carp all taken on red maggot was Andrew Rayment with 143lb. Dad Keith was second with 108lb all taken on paste over pellet while third place went to Dave Rees with 107lb 14oz followed by Ken Taylor on 98lb 12oz. Haddon Lodge: 1 Lucio Melillo Jn 38lb 10oz; 2 Martin Harwood, 31lb 4oz; 3 Martin Quelch, 20lb 11oz. The Tuesday Club, River Nene, North Bank: 1 Jim Inwood, 5lb 8oz; 2 Mel Saggers, 4lb 7oz; 3 Alan Jopling, 3lb 9oz. Float Fish Farm Fishery Open: 1 peg 2 (Wagtail) Simon Dow 135lb 8oz; 2 peg 10 (Wagtail) Andy Adams 129lb 10oz; 3 peg 3 (Wagtail) Roy Wells 100lb 9oz.